A gorgeous way to accent any living space, our Amish Buckhannon Sofa Table is made with care just for your home. 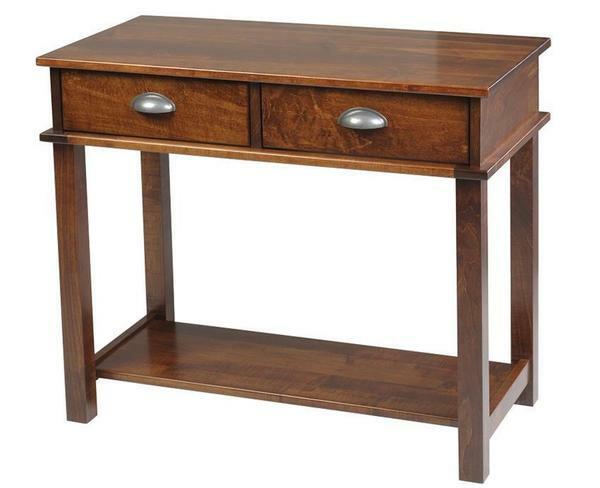 This heirloom quality piece is shown here in rich Brown Maple and topped off with Michael's Cherry Stain. Of course, you can create the custom combination of your liking using our various options. From cherry to quartersawn white oak, you are sure to find the 100% solid hardwood you are looking for! Complete with full extension drawer slides, you'll have no problem accessing all of the items you choose to store in the Buckhannon's ample drawer space. We offer the option to add the soft close feature for even further convenience. Please get in touch with our friendly Amish furniture experts to speak about all of your options: 866-272-6773. Be sure to check out the coffee table as well as the hall table versions of the Buckhannon. Browse all of our accent tables to find exactly what you are looking for.